10-Station Turret, Hydraulic Tailstock, 10” 3-Jaw Power Chuck, 5C Collet Nose, Coolant. RPM, Power Feed, 10” x 51” Table. Inch/Metric Threading, Tailstock, Steady Rest, KDK Tool Post, 8” 6-Jaw Chuck, 5C Collet Closer. 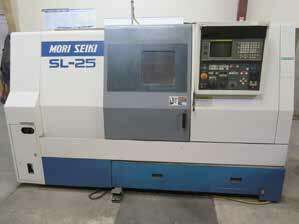 Hitachi Seiki mdl. 4A II Turret Lathe s/n E40607 w/ 40-2000 RPM, 6-Station Turret, Power Feeds, 10” 3-Jaw Chuck, Bar Feed. Wysong 72” Power Shear w/ 125” Squaring Arm, Front Supports, Foot Control. Head, Bending Dies and Tooling. Conrac / Leonard Tubemaster mdl. DF-HD Tube Double Flaring Machine s/n 84127-4. Dynaflare mdl. B-50 Tube Flaring Machine. Frederik mdl. 2236 36” x 22GA Hand Roll s/n463902. Enco mdl. 130-5400 Power Beader s/n 750661. DiAcro No.1 Hand Punch s/n B1363 w/ Stand. (2)Custom Electric Hydraulic H-Frame Presses. Kysor / Johnson mdl. J 9” Horizontal Band Saw s/n 20825. Boyar Schultz mdl. 612 6” x 12” Surface Grinder s/n 12518 w/ Magnalock Fine-Line Electromagnetic Chuck. Cutter Master mdl. HDT-30 Tool and Cutter Grinder s/n 2410B w/ 5C Air Fixture, Stand. Black & Decker Type TD 11/16” Super-Service Valve Refacer s/n 3176878. Hammond “Glider Trim-O-Saw” mdl. G4 Trim Saw s/n 3329. Collins Thread-O-Matic Automatic Pipe Threader. Despatch mdl. V-24STD 500 Deg. Electric Oven s/n 111466-L.
Everett mdl. 16DM 16” Abrasive Cutoff Saw s/n T-3534. Lincoln Idealarc SP-200 CV-DC Arc Welding Power Source and Wire Feeder s/n AC617851. Airco mdl. 2A/DDR-224HPA/B-D AC/DC Heliwelder s/n U476890. Airco mdl. MCM 200 Amp Transformer Welder s/n 10523. Ingersoll Rand Horizontal Air Compressor. Alltrade 16-Speed Pedestal Drill Press. Rigid 12” Miter Saw w/ Stand. Ryobi mdl. BT3100 10” Table Saw w/ Stand. Airflow Systems Industrial Air Cleaner. Generac 5000 Watt Gas Powered Generator. Lepel mdl. RWWEX110 Cooling Unit s/n 9515. Silver King Beverage (Milk) Cooler and Dispenser. Haas mdl. HA5C 4th Axis 5C Rotary Head w/ Haas Automation Brushless Rotary Control, Haas Mill Center. 8” 3-Jaw Pneumatic Indexing Chuck. Wohlhaupter and Criterion Goring Heads. Power Drills, Saws, Sanders and Grinders. Haskel Engineering mdl. 51213 20,000 PSI Hydraulic Tube Testing Machine s/n A-2479. ACL-Filco mdl. 9770-0114 20,000PSI Hydraulic Pressure Testing Machine s/n 1460-1. Nikon 12” Optical Comparator s/n 8155. Co-Check mdl. 100 CMM Machine w/ Tooling. Mitutoyo 12” Digital Height Gage. Crown 2000 Lb. Cap Electric Pallet Mover. Vermette mdl. 512A Material Lift. FMC Type YL-1A Automatic Banding Machine s/n 731016. Sheet and Bar Stock Material Racks w/ Aluminum Sheets and Plates, Aluminum and Stainless Bar Stock.